Whether you run a virtual team or have a brick-and-mortar business, there are ways to reduce your expenses. Making your own pay stubs can save you a small fortune in the long run. Follow these steps to create employment pay stubs on your own. If you aren’t already giving your employees pay stubs, you may want to consider making the change. Employment pay stubs can be a vital part of everyday life. Whether your employees are looking to rent a new apartment or trying to get a loan, odds are they’ll need to present a pay stub at some point. Creating paystubs for your employees in-house may seem like a daunting task. But it can actually be a very simple process provided you have the right tools. Creating employment pay stubs in-house can even end up saving your business a pretty penny in the long run. Don’t know where to start? We can help you out. Here’s everything you need to know about creating pay stubs for your employees. The first thing you need to do when creating pay stubs is to figure out your employee’s gross income. That is, the amount of money they make before deductions. Odds are you already have a system, such as a spreadsheet, where you keep all payment information in place. If you don’t, now would be an excellent time to create one. For hourly employees, you’ll need to multiply the number of hours they’ve worked by their hourly rate. For salaried employees, just divide their annual salary by the number of paydays per year. Remember to factor in any overtime or unpaid time off. Once you have your employee’s gross income, you’ll need to figure out deductions. This includes federal, state, and local taxes, as well as any extra withholdings such as Medicare and social security. While you can look up any and all tax information online, you’ll want to double check with an expert in tax law. 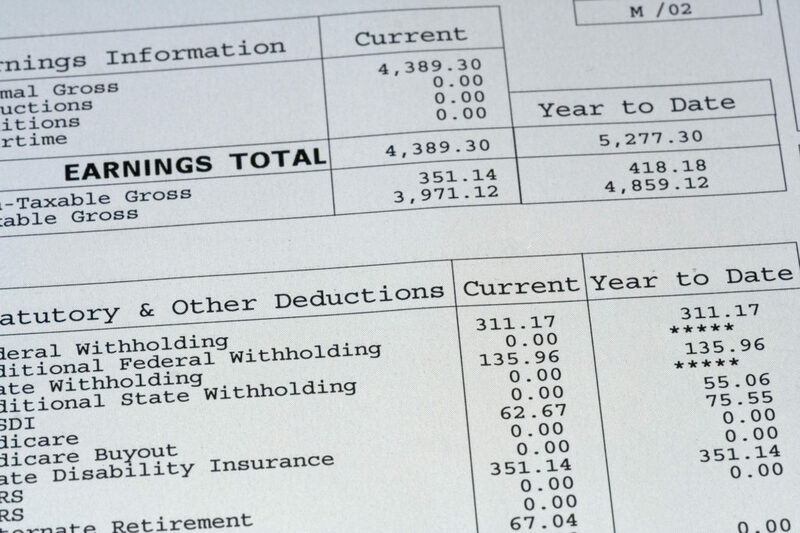 Once you’ve figured out taxes, you’ll need to calculate FICA tax withholdings. There are a few different equations you’ll want to keep in mind. To figure out Medicare withholdings, multiply each employee’s gross pay by 1.4 percent. Multiply their income by 6.2 percent for social security. Remember, as an employer, it is your responsibility to match these amounts. If you’ve set up any life insurance or 401(k) plans for your employees, you’ll want to deduct those amounts after taxation as well. Your employee’s net pay is the amount they get to pocket at the end of the day. After all taxes and withholdings have been accounted for this is the number you’re left with. This is the amount that will appear at the bottom of your employee’s pay stub. Thanks to the Internet, creating employment pay stubs has never been easier. There are dozens of websites that have pay stub templates already available. All you have to do is download them and fill them out. But, if you’re looking for an even easier way to make fake paycheck stubs, try PayStubCreator. Everything you need to create pay stubs is already on their website. All you have to do is have all your employee payment info on hand. Now that you know how to create employment pay stubs, now all that’s left to do is to go make them. It may be a little bit of a hassle — and a whole lot of math — but your employees will be grateful for all your hard work. Looking for a little more financial advice? We have dozens of articles to help you whether you’re trying to create a family budget or saving for your next vacation. Visit us today!